Some simple things... Politics, you gotta love it! Ain't this the sad, sad truth!!! 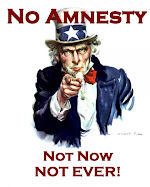 A citizen's comments regarding Illegal Immigration in the U.S.A.
1) They are an economic necessity - Not true. The idea that a bunch of desperately poor, uneducated, unskilled, non-English speaking foreigners are an economic necessity is ludicrous. In fact, when you compare cost vs. benefit, it is obvious that they are not only NOT a necessity, they are not even an asset. Rather, they are a liability and a huge one at that. 2) They do work Americans won’t do - Not true. They do work Americans won’t do for $7 an hour (especially if Americans can collect welfare and unemployment instead). Of course, if you got rid of the illegals, the jobs wouldn’t pay $7 an hour. The people who wanted the work done would have to pay a wage that was attractive enough to get Americans to do the work. And it might even be enough to get Americans off the unemployment and welfare dole and back into the taxpaying workforce! 3) We benefit from all that “cheap” labor - This is nonsense. The only people who benefit from the cheap labor are the unscrupulous people who hire illegal immigrants. Taxpayers are left holding the bag. Ultimately, it is they who must pay to support all the Americans who have been put out of work by illegals and must also provide billions of dollars in services and benefits to the illegals themselves. 4) They are just trying to make better lives - Aren’t we all? The difference is that most of us understand that we DO NOT have a right to acquire by illegal means those things that we find difficult to acquire by legal means. And we certainly don’t have the right to do it in a foreign country. 5) It is impossible to round up and deport the illegals - We don’t have to. All we have to do is remove the incentives that brought them here in the first place. No jobs. No housing. No taxpayer financed services or benefits (including education). Once we remove the incentives that brought them here, they will leave on their own. 6) Immigration control is racist / xenophobic - This is just another play of the race card by people who have no other cards to play. Immigration control is the world-wide status quo. There is nothing racist about it. Furthermore, the USA welcomes LEGAL immigrants of all races and ethnicities from all over the world who have gone through the legal immigration process. This is not just a bad argument, it is an attempt to create racial hatred and division. 7) We are a nation of immigrants - This is the “BIG LIE”. The vast majority of Americans are native-born. I am not an immigrant. Nor were my parents. Nor were my grandparents. We are a nation that has, historically, allowed and even encouraged LEGAL immigration. And we continue to do so. The issue at hand is illegal immigration, which has nothing to do with legal immigration. 8) They are people. We must treat them humanely - Yes & yes. But lets not pretend like they are victims who were dragged here kicking and screaming against their will. Nothing could be further from the truth. They came of their own free will and for their own benefit and they broke the law to do it. People should not be rewarded for breaking laws and committing crimes. Sending them home is the right thing to do. There is nothing “draconian” or “mean-spirited” about it. 10) They work & contribute to our society - So do I. And if I break the law and commit crimes, I can expect to pay a penalty of some kind. Anything from a small fine to the death penalty. I do not receive a reward. Why should we treat foreign criminals better than our own citizens? <<<<<<<<<<<<<<<<<<<<<<<<<<<<<<<<<<<<<<<<<<<<<<<<<<<<<<<<<<<<<<<<<<<<<<<<<<<<<<<< WOW!!! Great post!!! What more can be said? Pass this along to your representatives and senators.